Hazon, Jewish Organizations, Notable Press, Opinion, Participate! Here’s a little foray from recipes and cookie cutters: Jo Ellen Kaiser, editor in chief of Zeek Magazine, covered the burgeoning Jewish social justice sector for Sojourner’s Magazine, a liberal Christian mag. In it, she cites Hazon as an example of how the Jewish social justice movement has shunned the organized Jewish world. Over at Jewschool.com, they’re discussing whether that’s true or not. Last November, I koshered my kitchen for the first time. I did so with the full understanding that my decision came with certain compromises, like giving up my favorite cheeses and my delicious but uncertified collection of vinegars. While a bit heartbreaking, these were sacrifices I was willing to make as I welcomed in my new lifestyle. If only I had known that I might have to give up salad, too. Leafy salad greens, along with berries, asparagus and a variety of other produce, have come under serious scrutiny in the kosher world over the past decade. There’s nothing treyf about these particular fruits and vegetables, except that they have a tendency to attract insects, which are halachically forbidden. Once they are removed from a spinach leaf or the inside of a raspberry, the produce is theoretically fit to eat. But kosher agencies like the Orthodox Union and KOF-K argue that certain bugs (for example, aphids, thrips and mites) are too small to spot easily, but large and common enough to be compromising. Author’s note: The following is a drash I gave at my shul two days ago. My shul, Havurah Shalom in Portland, Oregon, is a participatory congregation. We are in the final days of Sukkot, one of Judaism’s three harvest festivals, and one of my favorite times of year. The traditional observance of Sukkot: building a booth, decorating it with greens and seasonal fruits and veggies, eating and sleeping under its roof through which we must be able to see the stars, all highlight and make holy things we do every day: living in our homes, eating meals together, even sleeping. Perhaps this is why I look forward to Sukkot so much, or perhaps that it often coincides with my birthday (I’m still young enough to enjoy rather than dread it), or perhaps simply that it happens during the autumn, my favorite season of the year. Judaism is particularly connected to food, and Sukkot especially to the bounty of our fall harvest. Now is the time for the first apples of the season, in all their amazing varieties, for winter squashes, for root vegetables, and for the last of summer’s abundance: the tomatoes, the zucchini, the pesto made from homemade basil. It is a time to celebrate the simple pleasure of growing and cooking and eating. 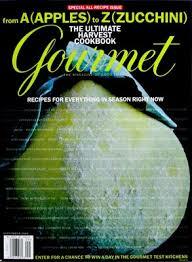 After 70 years of publication, Conde Nast is ceasing publication of Gourmet magazine, while maintaining its support of Bon Appetit magazine. As with many (most?) corporate decisions, it was a precipitous one, announced to its staff on Monday just as the November issue was off the presses. As an immigrant to this country, I learned about the cultural rituals of my new country through the Girls Scouts manual– obtained from my small, neighborhood library, another American treasure– and later on, the pages of the food magazines. The National Geographic was too arcane for me, but Bon Appetit broadened my cultural horizons past my family’s tenement apartment in New York’s Chinatown. It showed me what people really do eat in their own homes and how to prepare their dishes. It gave me a cultural passport, even before I could afford to travel on my own salary. Dessert Hummus?! What is the World Coming To? I love hummus. I really do. I had some this morning for breakfast. I will probably have some with dinner. I seriously considered running away with my favorite hummus-seller in Machane Yehuda when I lived in Israel. But even I have never really considered the possibility of a sweet hummus. I mean, at its base hummus is mashed chickpeas. And when I think chickpeas I don’t think dessert. Well lucky (?) for me, there are people in the world who don’t think the way I do when it comes to chickpeas. They saw hummus as a dessert-in-the-making. And they added some cocoa powder and some sugar (sugar! The humanity!) and they called it Chocolate Hummus. Yeah, I know, as Jews we’re supposed to rest from our weekday labors on Shabbat. Jews who observe Shabbat more traditionally than I do tend to refrain from social action on Shabbat, including the practice of tikkun olam, repairing the world. However, there is a ruling in Talmudic law (isn’t there always?) that allows us to sidestep Shabbat prohibitions against typical activities, called pikuach nefesh, saving a life (soul). Here’s a more complete explanation of the concept. So why am I violating Shabbat by posting on The Jew and the Carrot today? I have to admit that I’m pretty surprised that none of the contributors at Jew and the Carrot has mentioned anything about shiva asar b’Tammuz, or the 17th of Tammuz, a fast day that fell this year on July 9th. I don’t mean to wag my finger – I’m not keeping the fast days either – nor compete with Rabbi Mark Hurvitz’s elegant post regarding fasting as a mode of consciousness-raising about Darfur. But I do think it’s worth contemplating what it means, as a Jew, to refrain from food. Frankly, the topic of fasting should be a part of our collective conversation, in the aftermath of the AgriProcessors and Rubashkins fiasco, of what it means to be kosher. The Chicken or the Ache? In my hard-core college vegan days, when I toted around a copy of John Robbins’ Diet for a New America like it was from Mt. Sinai, I often wondered how I would approach the subject of meat eating with any future children I might have. The idealized plan that I came up with (while still a bachelor, of course), was that we would have a strictly vegetarian household until my future children reached the age of Bar/Bat Mitzvah. At that point, I would give them a copy of Robbins’ well-written argument against consumption of animal products, take them on a tour of the closest factory farm and/or meat processing facility, and then let them make their own informed adult decision about whether they wanted to consume meat from that point forward. If they choose to eat meat at that point, more power to them. Of course, nearly twenty years later as the (flexitarian? vegewarian?) parent of two toddlers, things are not so cut and dry. Nowadays, Michael Pollan’s Omnivore’s Dilemma has replaced John Robbins on my shelf, and we are indeed an omnivorous household. Things seemed to be going smoothly – we support our Tuv Ha’aretz CSA, shop at Whole Foods (or at least the organic aisle at Stop & Shop), and try to follow Reb Pollan’s core dictum: “Eat Food, Not to Much, Mostly Plants.” We try to keep limit any meat we consume in the home to that produced in a sustainable, ethical manner. Emergency roadtrip Burger King stops aside, we’ve done a decent job of modeling the ideals of eco-kashrut to our kids. Is the Food Movement Elitist and if so, Does it Matter? My interest in food and my work within the food movement began, as passions do, at the personal level. I love eating and cooking and growing food, and I wanted to learn more about what went into the food I ate. Simple as that. Over the past couple of years, I’ve done a lot of self-educating, in the form of reading, research and writing about food. I’ve also shared what I’ve learned with friends and family, who, to my pleasant surprise, seem interested in the topic, even if not to the total-immersion-extent that I am. The universality of this issue is clear, since we all need to eat. In the daily inundation of political scandal, violence, government infighting and general economic and social mayhem that we Israelis can’t seem to live without (judging by our consumption of news media), a proposed new tax on fruits and vegetables has garnered little public outcry. Until now, fruits and vegetables have been exempt from the 16.5% value-added tax (v.a.t.) placed on nearly every other consumer item. But foods like tomatoes, cucumbers, onions and eggplant had been considered basic daily necessities, like bread and milk (both of which are still price-controlled). Keep Your Laws Off My Body? Ever since the right to privacy went down on sheepskin, there’s been a cornucopia of confusion about whether or not American law should regulate personal choices, and what those “personal choices” are. As law makers get more and more worked up over “the epidemic of obesity”, and their constituents’ new interest in food, they look to legislate people’s eating habits from both the consumer (taxes on soft drinks, calorie counts in fast food) and the producer ends. As I listen to pizza makers bemoan the loss of transfats, community activists struggle to increase access to fruits and vegetables in poor neighborhoods, and local curb-sitters mark the price of a smoke in NYC, I get to wondering where all of this interest in our personal habits comes from, and whether the government really has the right to legislate it in the first place. I asked my brother, the recent law school grad (though not yet lawyer) to dispel some of the mists of obscurity surrounding civil rights in general. What follows is a highly simplified version of his explanation, as filtered through my not-too-legal mind.